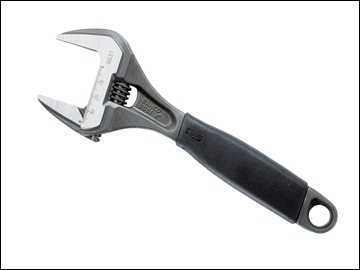 The Bahco 90 Series Black Phosphated ERGO™ Adjustable Wrench has a 40% wider opening compared to a standard adjustable wrench of equivalent size. The head combines slimness for accessibility with strength for performance, this combined with a convenient length of the handle and low weight make it perfect for plumbers and other tradesmen that carry their tools with them. The jaws are angled at 15° to provide maximum access in confined spaces.